Aitor Karanka praised the quality of his Middlesbrough squad after Christhian Stuani’s double against Sunderland secured their first Premier League victory since their return. 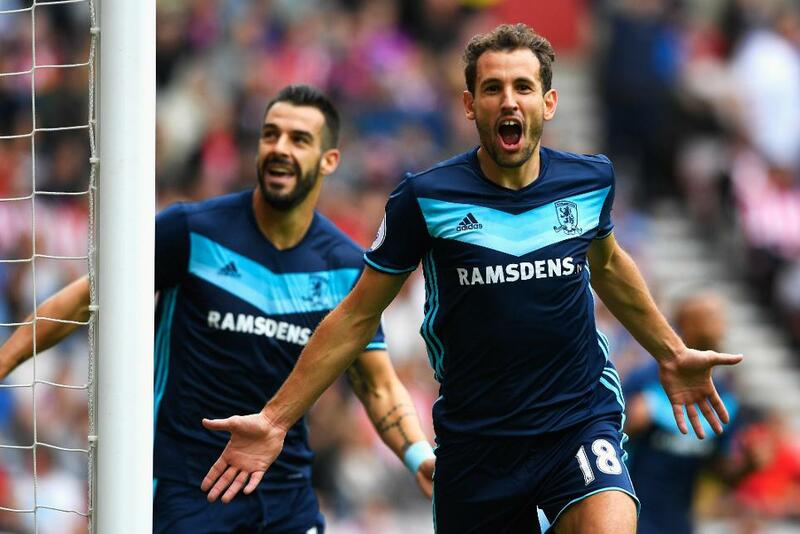 Stuani put Boro in front with a spectacular long-range strike, before benefitting from a second successive assist from Alvaro Negredo to double the hosts’ advantage. Patrick van Aanholt pulled a goal back for Sunderland, but promoted Boro held on to take their tally to four points from two matches this season. “It is always most important to win the game,” Karanka told mfc.co.uk. “But it is especially important in a derby, for the crowd. They have been waiting for this moment. "The key was the first half. I told the players to start at 150% but with players of the quality of Cristhian Stuani we were able to score a first goal like that which opened up the game. “When you have those players, you know that you can score any time. We are building a very good squad and I am really pleased. David Moyes has suffered two 2-1 defeats at the start of the campaign, but the Sunderland manager was encouraged by his side’s display, despite losing captain John O’Shea to injury. "I did not think we deserved to be 2-0 down at half-time,” Moyes told safc.com. “After we lost O'Shea, we did not get quite sorted. We did not take some chances but they did.